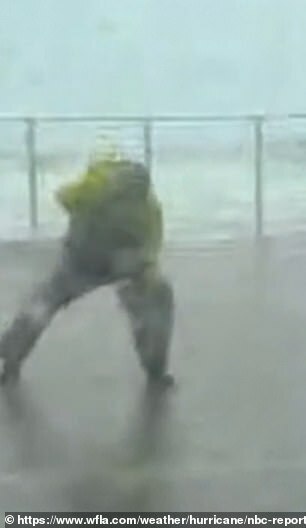 A Weather Channel meteorologist was nearly impaled by a plank of wood while recording a live report during Hurricane Michael. 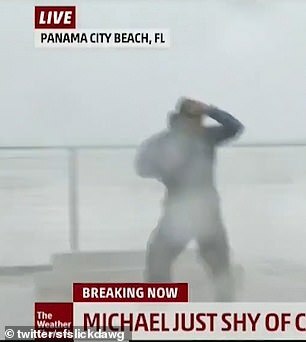 Jim Cantore was reporting from Panama City Beach, Florida, during 155 mph winds when he had to jump out of the way of an airborne 2x4. The notorious meteorologist also attracted attention for rescuing NBC's Kerry Sanders who was nearly blown off his feet before Cantore ran over and held him upright. Sanders thanked the meteorologist in two tweets after his live report, praising Cantore and stating that he avoided a concussion after being blown into a concrete pillar. 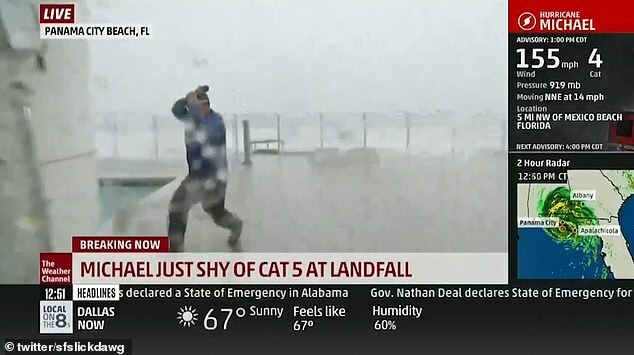 In the footage, Cantore is seen delivering a piece-to-camera when suddenly the piece of wood comes flying at him. Thinking he's about to be hit, the meteorologist breaks off mid-sentence and jumps out of the way while clutching his head. 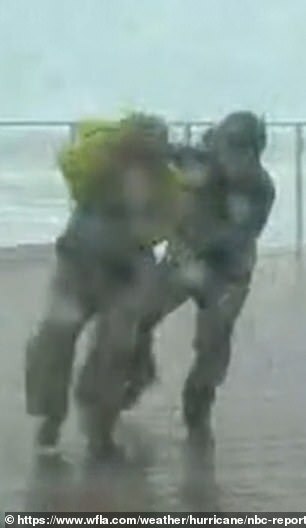 In a separate clip, Kerry Sanders is seen swaying back and forth as the ferocious winds nearly blow him over. 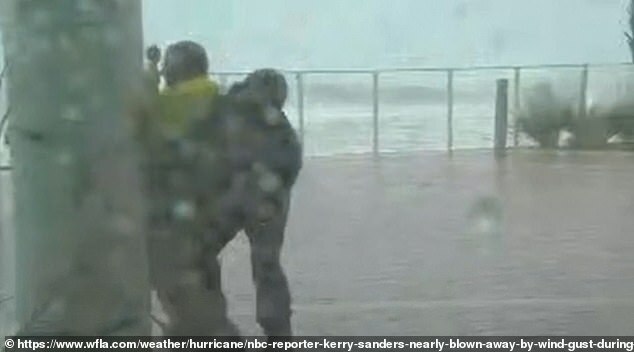 He crouches down on the ground to keep his balance before Cantore walks through the storm and walks Sanders behind a pillar where he was somewhat protected from the winds. Hurricane Michael hit the Florida Panhandle on Wednesday afternoon as a catastrophic Category 4 hurricane, pushing a deadly storm surge and whipping the coast with 155 mph winds. The eye of the monstrous hurricane made landfall near Mexico Beach just before 2pm and the eyewall came ashore minutes earlier between Panama City and St. Vincent Island. 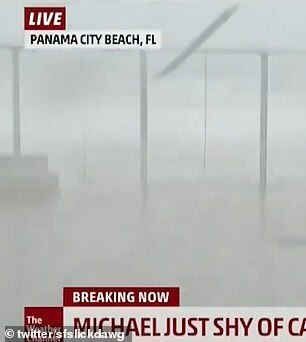 Hurricane-force winds extended outward up to 45 miles from the center and were tearing buildings apart in Panama City Beach. Beachfront structures could be seen collapsing and metal roofing materials were blown away amid the heavy rain. Forecasters said rainfall could reach up to a foot and the life-threatening storm surge could swell to 14 feet. By 3pm, Michael still had top sustained winds of 150 mph as its core moved over Florida's Panhandle. Michael, which was supercharged by abnormally warm waters in the Gulf of Mexico, is one of the most powerful storms to hit the U.S. mainland in nearly 50 years. Authorities told residents along the affected areas of Florida's Gulf of Mexico coast on Wednesday morning that they had run out of time to evacuate and should hunker down. More than 375,000 people had been urged or ordered to evacuate, but emergency authorities lamented that many people ignored the warnings and seemed to think they could ride it out. Two people, including a child, have been killed by falling trees, officials say. The storm has left nearly 500,000 people without electricity in Florida, Alabama and Georgia.